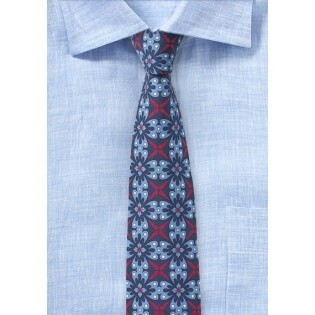 Turn your casual summer wear into a masterpiece with this skinny necktie from Cantucci. 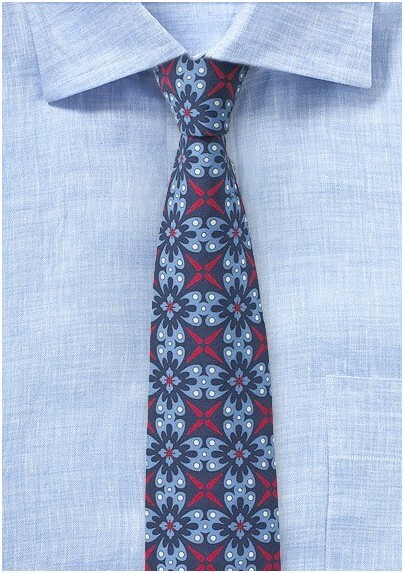 Featuring a Wild Spanish Tile geometric design in navy, light blue, and red, this item will not disappoint when paired with a linen or cotton dress shirt in pale blue, white, or gray. Add some punch to your summer wear with this new collection all inspired from traditional tile patterns. Handmade from printed cotton. 100% Printed Cotton | Narrow Width: 2.75", Length: 58"